Of all the recipes, my favorite are Egg Fried Rice and Noodles. It could be any fried rice not necessarily Egg Fried Rice. During my childhood days, whenever I go to restaurants, I order only fried rice and noodles.
. I wanted to post Vegetable Fried Rice, Egg Fried Rice, and Chicken Fried Rice since long time. Finally, now I have come with the Egg Fried Rice recipe. 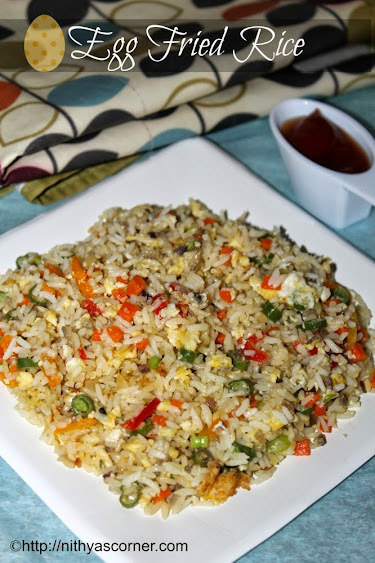 This is a basic Egg Fried Rice recipe made with leftover rice and customized in an Indian way. You can be done in just few minutes. Since this is basic Egg Fried Rice, I did not use soya sauce or chilli sauce. I used just the normal ingredients that is available at our kitchen. Do try it out and let me know how you liked it. Spring onions – 2 nos. Green Chilly (finely chopped) – 1 no. 1. Chop all the veggies. In a non stick pan, heat two tablespoon of oil. Add the chopped ginger and garlic and sauté until they turn golden brown. Then add the chopped onions. 2. Fry onions for a minute or so, then add the chopped vegetables. Fry for three to four minutes in high flame. Vegetables should be cooked 3/4th. Make sure the vegetables do not become too soft. Add pepper powder, and then reduce to medium flame. Then add the leftover boiled rice. 3. Stir the rice well. Now add the eggs and salt in medium flame, give a quick stir. 4. The eggs will combine well with fried rice and the scrambled eggs will also be cooked by now. 5. Once you make sure the scrambled eggs are cooked well, add the chopped spring onions and lemon juice. Give a quick stir and bring the vessel down. Now Egg Fried Rice is ready! Serve the Egg Fried Rice with Tomato Ketchup, Sweet and Sour Pineapple Chutney, Chilli Chicken. Mushroom Fried Rice, Egg and Soyabean Sprouts Fried Rice. Use boiled rice that has been cooked and cooled down completely. Instead of normal onions, you can also use white part of the spring onions. You can also use the Basmati rice instead of the regular rice. Instead of finely chopped ginger and garlic, you can use ginger garlic paste too. The veggies should not be soft. They should be little crunchy. 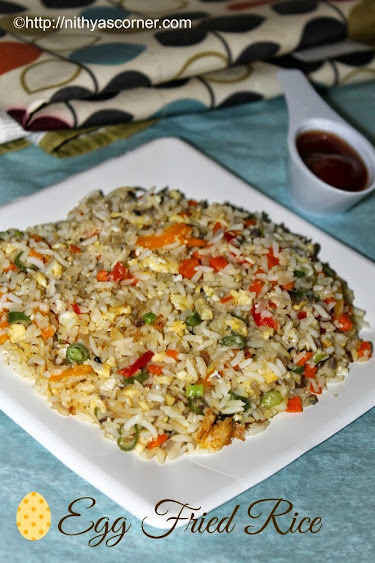 This entry was posted in Fried Rice and tagged Chicken Fried Rice, Egg Fried Rice, Egg Fried Rice recipe, Fried Rice, Vegetable Fried Rice on November 22, 2014 by vikashbhardwaz.